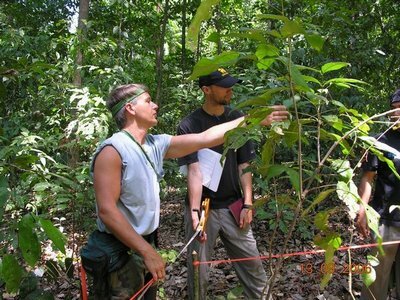 Randy Kyes, left, instructs UW student Elliot Smith during a field exercise on Tinjil Island, Indonesia as part of the International Field Study Program-Indonesia. Randy Kyes, second from right, conducts a field training exercise with Nepali students in Langtang National Park in the Nepali Himalayas. When Lauren Jorelle was a UW student, she went to Indonesia as part of a field study program sponsored by the Washington National Primate Research Center and the Department of Psychology. The experience was a good one — so good that she elected to go back on her own to do further research through the Indonesian university the UW collaborates with. Jorelle’s experience was facilitated by Randy Kyes, research professor in psychology and head of the Division of International Programs at the primate center. Jorelle later became the division coordinator of international programs at the center, and is currently serving as a part time administrator for Kyes’ latest venture — The Center for Global Field Study. With the center, Kyes hopes to expand the programs that made Jorelle’s adventure possible. He’s been conducting collaborative field training programs in Indonesia since 1991, and over time has added programs in Thailand, Bangladesh, China, India, Nepal, D.R. Congo, Brazil and Mexico. It all started with his own research. The program became annual, and by 1995, UW students were joining the Indonesian ones in the field study program, officially known as the International Field Study Program-Indonesia. That enabled both groups to not only learn about the environment, but also have an opportunity for cultural exchange. More than 60 UW students have been through the program since then. Meanwhile, Kyes’ colleagues — both at the primate center and at universities in other countries — heard about what he was doing and thought that it could be replicated elsewhere. He’s been doing annual field training programs with partner institutions in a number of countries since then. Given that the collaborative programs originated through the primate center, they have focused on primates. But Kyes wanted to take the next step and expand into general environmental issues as well as into global health. “We’re now beginning to focus heavily on the interface between the environment and human health,” he said. The center now has an office on the first floor of Gerberding and an advisory board that represents many constituencies on all three campuses of the UW. That’s a pretty big dream, but Kyes is already partway there. He says that students from his first field course back in 1991 are now moving into positions of authority where they can implement policies and make a difference. The center is currently operating with support from the Office of Global Affairs and related small grants, including support from the Woodland Park Zoo for the global field training programs. Kyes is also in the process of applying for more substantial grant funding to support the center’s growth. He says he and Jorelle are happy to talk to students, faculty and staff who are interested in field study programs or who would like to partner with the center. They can be reached at cgfs@u.washington.edu.